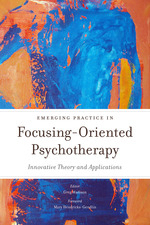 Emerging Practice in Focusing-Oriented Psychotherapy brings together some of the world's most influential contemporary psychotherapists in the field to look at the future of Focusing-oriented approaches. Focusing-Oriented Psychotherapy - a form of therapy that involves listening to the innate wisdom of the body - is a dynamic and growing field that has evolved greatly since Eugene Gendlin first published the text Focusing-Oriented Psychotherapy in 1996. This book explores recent innovations such as Focusing-Oriented Psychotherapy as a response to trauma, Wholebody Focusing, and how Focusing has been adapted in Japan and South Korea. One section looks at specific contemporary issues and emerging practical applications of Focusing-Oriented Psychotherapy, such as how Focusing can be used in wellbeing counselling and to help decision making processes in counselling and therapy. By offering new alternatives to working effectively with difficult issues and specific client groups, this volume will appeal to a broad range of therapists, coaches, and other practitioners. Jessica Kingsley Publishers also publishes a companion volume, Theory and Practice of Focusing-Oriented Psychotherapy: Beyond the Talking Cure, edited by Greg Madison.